Jonas Makwakwa resigned on Wednesday after a series of stories published by Scorpio on the cooked Hogan Lovells investigation and disciplinary hearing that cleared him of “all charges” as well as news that he sat on the SARS panel that signed off on the appointment of a debt collector linked to Makwakwa and a possible money laundering ring. The resignation was hastily pushed through amid Cabinet considering tax boss Tom Moyane’s “imminent” departure. We analyse Moyane’s misleading public statement about Makwakwa’s departure and find many holes. By PAULI VAN WYK for Scorpio. Tax boss Tom Moyane once again tied his fortunes to that of former Chief Officer for Business and Individual Tax Jonas Makwakwa when he read out a statement to the country about Makwakwa’s sudden resignation. Parliament’s standing committee on finance did not take kindly to the stunt. Carrim continued, saying international law firm Hogan Lovells’s conduct in the Makwakwa investigation should be investigated further. “We feel very strongly that in view of the role that SARS plays, it’s important that senior SARS officials are not just above reproach, but are seen to be so,” Carrim said. The DA’s Alf Lees said it is “deeply concerning that allegations of corruption and money laundering did not stop Makwakwa from being reinstated to his senior position at SARS… Moyane and Makwakwa’s alliance of mutual destruction has run its course…”. Moyane’s conduct in the Makwakwa saga is so questionable and his statement on the matter so misleading that it cannot be left unchallenged. Based on Scorpio’s six-month investigation into the conduct of Moyane and Makwakwa, we are able to rebut Moyane’s statement, based on letters between Moyane, Makwakwa’s lawyer, the ministers of finance and the director of the Financial Intelligence Centre. We also have the disciplinary findings that “cleared” Makwakwa, conducted interviews with Hogan Lovells, senior officials in SARS and national treasury and used Moyane’s statements to the public and Parliament. The text in Italics is Moyane’s verbatim statement as published on 14 March 2018. Our comment follows each paragraph. Good afternoon ladies and gentlemen, members of the media, the general public and South African community at large. I am greatly humbled and indebted to the members of the media in heading to the call to be present this afternoon for this media briefing, particularly taking into account that the media briefing was called at extremely short notice. I wish to announce that Mr. Jonas Mashudu Makwakwa (“Makwakwa”) has resigned this morning from his employment with the SARS as the Chief Officer: Business and Individual Taxes (“BAIT”). Mr Makwakwa’s resignation is effective immediately as of 14 March 2018 at 11am. Jonas Makwakwa was accused by the Financial Intelligence Centre (FIC) in May 2016 of tax evasion, money laundering, corruption and stuffing hundreds of thousand rand into ATM’s. Makwakwa was suspended on 15 September, four days after Susan Comrie of amaBhungane lifted the lid on the matter. I would like to briefly explain the chronological sequence of events that has led to Mr Makwakwa’ s resignation. Before I do that, it would be prudent to state that in his letter of resignation, Mr Makwakwa has indicated that he is resigning for personal reasons. Makwakwa’s resignation actually comes two days after Daily Maverick revealed that he is linked to SARS new debt collector, awarded with a tender to collect part of R16.6-billion in debt owed to SARS. Between November 2017 and March 2018. Daily Maverick also published several stories relating to impropriety on Makwakwa’s part, including a series of five stories titled the Makwakwa Dossier. More pertinent, however, is that Business Day’s Natasha Marrian and Genevieve Quintal wrote on Thursday morning that Moyane’s exit seems to be “imminent”. 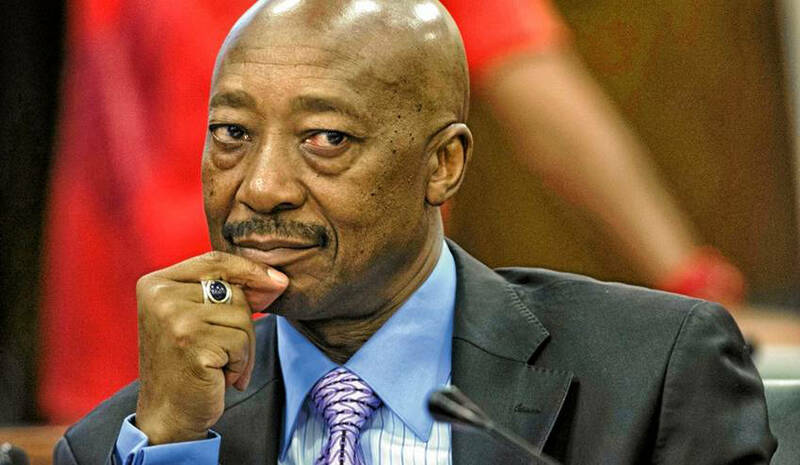 Moyane’s removal from the revenue service was reportedly put to Cabinet over his handling of the Makwakwa debacle. Knowing this, Moyane hastily convened a media briefing to announce the “resignation” of Makwakwa. (Makwakwa) regards this as being an opportune moment for him to exit SARS after being cleared of all the allegations of misconduct through a formal disciplinary hearing, and after making the investigation report into allegations of impropriety against him, and his personal tax information available to Parliament for scrutiny and for public accountability. Makwakwa did not answer to “all the allegations of misconduct” that related to him being suspended in the first place. Scorpio’s investigation found that Makwakwa answered to a small portion of the allegations in the FIC report after the investigation was tailored with the help of law firm Hogan Lovells. Makwakwa has been cleared of allegations that had nothing to do with the FIC report. The very reason for his suspension was therefore not removed before he was parachuted back into SARS. I shall deal with aspects of the investigation and Parliamentary processes later in this statement. Mr Makwakwa has served SARS for the past 22 years. As a result, I thank him for his loyal service and wish him well for all his future endeavours. To thank Makwakwa for his loyal service to SARS is like thanking a rattle snake for biting you – absurd. Makwakwa has brought SARS into disrepute and ensured untold damage upon the reputation of the institution as well as Moyane’s reputation. Allegations did not “emerge”, it landed in the form of a damning preliminary investigative report by the FIC on Moyane’s table on 18 May 2016. The FIC ordered a proper and thorough investigation, which did not happen. Moyane came under fire for not reporting the matter to the Hawks himself. The first time Moyane communicated with the Hawks over the Makwakwa matter was when a Hawks investigator contacted Moyane on 15 September 2016. The Hawks email was prompted by amaBhungane’s breaking story on the Makwakwa debacle. Recent allegations of impropriety against Mr Makwakwa in respect of the selection and appointment of NEW INTEGRATED CREDIT SOLUTION, a debt collection agency. Director Baker Maseko’s company New Integrated Credit Solution (NICS) was the very first company named in the alleged money laundering ring fingered by the FIC report into Makwakwa. The Department of Water Affairs and Forestry paid R17.7-million into the account of NICS. From here the money, in diminishing figures, moved through the accounts of 12 entities before R600,000 landed in Makwakwa’s private bank account. The FIC submitted the investigation report and was received by SARS during the course of May 2016. Upon receipt of the report, I engaged with the FIC with regard to the need for the FIC and the SARS to co-operate with each other in respect of an investigation into allegations of corruption, money laundering, and possible violation of tax statutes against Mr Makwakwa. Using the words “co-operation” do not mean that is what actually happened. Based on letters between Makwakwa’s lawyer, Moyane and the Director of the FIC, Scorpio proved that Moyane in fact misused SARS as a post box in order to illegally ferret out information from FIC in order to help Makwakwa. The FIC submitted the report to the Hawks and the Hawks had commenced with its criminal investigation under DPCI inquiry 3/06/2016. This criminal investigation is ongoing and SARS is fully co-operating with the investigation. The Hawks wrote to Corruption Watch in October 2017 saying that the arrest of Makwakwa, Moyane and Kelly-Ann Elskie is “imminent”. This was days before Moyane allowed Makwakwa back in SARS. With regards to the FIC, it must be noted that SARS did not receive the much needed assistance and this process took longer than anticipated. With hind sight the differences between the FIC and SARS on this matter should have been resolved speedily. Moyane lives in a parallel universe. The reality is that then FIC Director Murray Michell got wind of Moyane’s attempt to assist Makwakwa. Michell sent a scathing letter to Moyane warning him that disclosing FIC information to the subject of an investigation is a criminal breach of the FIC Act. By now it is well established that Moyane do not react well to any type of rebuke. He trashed the FIC in the public, saying the FIC refused to cooperate and assist SARS. The letters show however that the “cooperation” Moyane wanted was aimed at assisting Makwakwa’s case against the FIC. Then minister of finance Pravin Gordhan warned Moyane that he is hurting the working relationship between SARS and FIC by issuing a public rebuke of the FIC. Astonishingly, Moyane now seems to think someone in that toxic triad should have handled the matter better. As a result of lack of assistance from the FIC, during September 2016, SARS proceeded to suspend Mr Makwakwa on the basis of the allegations contained in the FIC report. Moyane suspended Makwakwa four days after amaBhungane lifted the lid on his Makwakwa-secret after four months of inaction. 20 May – Moyane reads the FIC report. Acting quickly, Moyane on the very same day writes a letter to Makwakwa and asks for an explanation by 23 May. Based on Makwakwa’s bank statements, we know that the mysterious payments into his account suddenly stop – Read: Makwakwa Dossier Part 3 for more on this fact. We also know, based on a letter by Gordhan, that Makwakwa accompanied Moyane to meetings with Gordhan and the Davis Tax Commission and was allowed to meet with taxpayers for four months while the FIC investigation hung over his head. Moyane did not only keep the fact a secret from Gordhan, the public, Parliament and his own SARS colleagues, but he also allowed Makwakwa to continue working on sensitive cases for the next four months. Makwakwa, in the meantime, asks Moyane for repeated extensions to get his explanation in order. This situation drags on until early August 2016. 10 August – Liezel David, Makwakwa’s lawyer, asks Moyane to request information from the FIC. She inserts a lengthy list. Moyane complies. He writes at least four letters between 10 August and 10 September in order to get the information out of the FIC on behalf of Makwakwa. As explained elsewhere, this is an illegal act in terms of the FIC Act. Read: Makwakwa Dossier Part 4 for an in-depth analysis. 11 September – amaBhungane reveals the FIC report and says Moyane has kept it under wraps since May 2016; 11 September 2016 is a watershed date. After the news spilled into the public, Moyane suddenly jumps into action. 12 September – Pravin Gordhan meets with Moyane. 15 September – Hawks write to Moyane after reading the amaBhungane story. This is the first contact between the Hawks and SARS about the Makwakwa/FIC matter. 15 September – Makwakwa is suddenly suspended. Hogan Lovells is appointed to conduct an investigation. During October 2016, SARS appointed Hogan Lovells to conduct an investigation into allegations of impropriety against Mr Makwakwa. Hogan Lovells were also instructed to appoint Price Water Cooper (“PWC”) to assist with the investigation and in particular with regard to an analysis and audit of evidence of Mr Makwakwa’ s financial affairs. Hogan Lovells was appointed and briefed in September 2016, as disclosed in the timeline above. Investigate the FIC’s allegations relating to tax evasion. This report was provided to SARS, who refused to hand it over to Hogan Lovells in order to conduct a proper investigative analysis. According to Modise the PWC report was finalised. Moyane later told Parliament the tax investigation was not finalised. Scorpio cannot say at this moment who is lying. Hogan Lovells together with PWC finalised the investigation and submitted a report to the SARS around May 2017. In the main, the Investigation Report recommended that disciplinary proceedings be instituted against Mr Makwakwa and in particular with regard to his failure to make the required declarations in accordance with the SARS Ethics Policy, and possible contravention of the Public Finance Management Act 1 of 1999. Moyane again does not refer to what exactly was investigated. His misleading statements became the crux of Part 5 of the Makwakwa Dossier. From our investigation it is clear that Moyane lied to Parliament about the extent of the Hogan Lovells Investigation Report and the Disciplinary Findings signed by adv. Terry Motau SC. Moyane’s public and Parliamentary statements linked both reports directly to allegations made by the FIC. The Disciplinary Findings signed by Motau has no relation to the FIC report. The Hogan Lovells investigation Report has some relation to the FIC report, but does not discuss the merit and conclusions relating to all the allegations made in the FIC report. These two reports must be submitted to Parliament on Friday after Moyane received a stinging rebuke from MP’s and faced being subpoenaed to produce the reports. Further, the Investigation Report recommended that the aspects of the investigation pertaining to money laundering and corruption be fully investigated by the DPCI as an authorised authority with the necessary capability. Most notably is that Hogan Lovells’ Modise did not ask the Hawks for a status report on the matter. If they did, they might have known that the Hawks seems to have a strong case against Makwakwa and that his arrest was “imminent”. There was no justification for Makwakwa’s return to SARS. It is a matter of public knowledge that Mr Makwakwa was cleared of all the charges at the disciplinary proceedings chaired by Adv. Terry Motau SC. The investigation into corruption and money laundering is ongoing and the SARS is cooperating with the DPCI. Together with SARS, a decision has been made to make Makwakwa’s tax records available to Parliament under conditions agreed between SARS and the Standing Committee on Finance. Mr Makwakwa’s tax records will be submitted together with the Investigation Report by Hogan Lovells and incorporating the Report by PWC. The said Report will be submitted on or before 16 March 2018. As mentioned, this criminal investigation is ongoing and the SARS is fully cooperating with the DPCI. As I understand the allegations, on 13 and 14 March 2018, the media widely reported that Mr Makwakwa irregularly participated in the tender adjudication and appointment of NICS by SARS, notwithstanding the ongoing criminal investigation by the DPCI into allegations of corruption and money laundering involving Mr Makwakwa and NICS together with other entities in respect of payment of over R400 000 (Four Hundred Thousand Rand), paid to Mr Makwakwa. These allegations are currently being investigated by the DPCI on the basis of the FIC report of May 2016. It was R600 000, not R400 000. As I understand the allegations, Mr Makwakwa was conflicted as he failed to declare a potential conflict of interest, acted dishonestly, failed to act fairly and failed to recuse himself from the adjudication as the circumstances duly required. Makwakwa sat on the committee that signed off on the appointment of eight debt collectors, including NICS. Makwakwa seemingly wants us to believe that he did not recognise the name of the company included in the damning FIC report that got him suspended for over a year. I have formally put this matter before Mr Makwakwa with the intention to suspend him in respect of the said allegations pending an investigation. At this point, he denied the allegations and indicated to me that he had already decided to resign. Due to the resignation being effective immediately, it serves no purpose to proceed with this matter from an employment relations perspective. However, an investigation will proceed to probe the allegations of irregularity surrounding the appointment of NICS. The matter will also be referred to the DPCI for criminal investigation. What Moyane should do is file a complaint under Section34 of the Prevention and Combatting of Corrupt Activities Act (PRECCA) relating to the incident. If Moyane does not do so, he himself can be criminally charged for dereliction of duty. It seems that this is what Moyane refers to here. Furthermore, the SARS is currently preparing a letter to NICS to give cause why the bid should not be suspended pending an investigation. In this regard, SARS reserves its legal rights in law including instituting legal proceedings to terminate the relationship between the SARS and NICS. It is not the first time that Moyane is in a questionable position thanks to a dodgy debt collector. Previously, Moyane’s nephew bagged a possibly lucrative debt collecting contract from SARS. Nhlamulo Ndhlela’s company, Lekgotla Outsourcing, was part of Lekgotla Trifecta Collections – a consortium that was at the time awarded a contract to collect over R2-billion of debt. The family relationship between Moyane and Ndhlela was allegedly not disclosed to SARS’ bid adjudication committee. The matter caused a public furore and SARS jumped to get the contract dissolved. As the Commissioner, I would be negligent if I did not admit that the incidents surrounding the issues on Mr Makwakwa have taught us valuable lessons. I am sure there are areas that we could improve on and could have handled better.